Confidential services include support for a survivor or the friends of a survivor, help filing a complaint (if that is the student's choice), and help navigating resources at Brown and in the community. 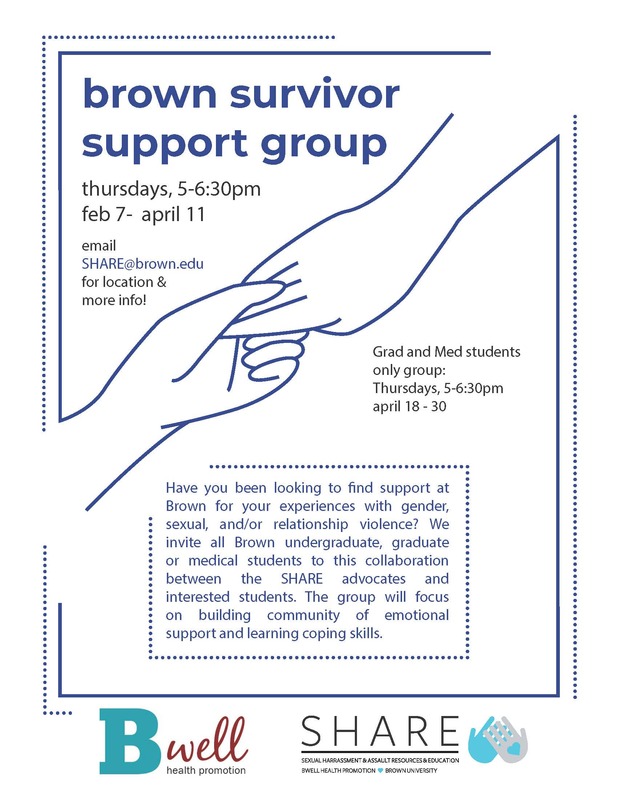 SHARE Advocates are available to meet in quiet spaces in the offices of BWell Health Promotion (top floor of Brown University Health Services) or at one of several different locations on campus should you prefer. The SHARE Advocates also offer educational programs for the Brown community and advise the Sexual Assault Peer Education program. The SHARE Advocates, along with CAPS clinicians, serve as on-call clinicians for the 24-hour Sexual Assault Response Line (401.863-6000). The Sexual Assault Response Line connects students with confidential crisis support and information. The on-call counselor is also available to accompany a victim to the hospital. To make an appointment with a SHARE Advocate, you can place a request online, or call the office at 401.863-2794. In addition to one on one support described above, the SHARE Advocates offer support groups for survivors each semester. For Spring 2019, a support group for all students will meet on Thursdays from 5-6:30 pm, running from February 7- April 11. A support group for graduate and medical students only will meet on Thursdays from 5- 6:30 pm, running from April 18-30.